Chicken pot pie is a favorite of mine and has been forever! This is a cheap recipe to make and even cheaper if you make a big batch and freeze the leftovers!. I personally like it with some cubed potatoes added inside but it’s very good without them! I made them in batches of 8. They freeze so well, I have a stockpile in my freezer. They stack beautifully in the freezer and hardly take up any room. Once the pot pies have been filled and covered with the pastry dough, cover with foil and freeze. To reheat: thaw ahead of time and bake, uncovered, according to the directions and you will have no issues at all. Prepare the crust first. In a large bowl combine the flours, salt and baking powder. Add the shortening, and mash it into the flour until it is crumbly. Add the water and stir to combine. Gather the particles up into a ball of dough. Roll the dough out between sheets of waxed paper, to make a large rectangle. Set aside. Oil a 9 by 13-inch pan. In it arrange the chopped chicken and the mixed vegetables. Set this aside. In a large saucepan melt the margarine or butter. Add the onion and celery, and saute it all around until the onion is tender and fragrant. Sprinkle the flour over top of the vegetables and stir it up nicely. Pour on the broth. Stir everything around to dissolve the flour in the bouillon. Add the pepper and poultry seasoning. Bring the gravy to a boil while you stir it frequently. Boil for a few minutes to blend the flavors and thicken. Pour the hot gravy over top of the chicken and vegetables in the pan. Stir it up a little, to get everything evenly moistened. Arrange the dough on top of the chicken and vegetables. It doesn’t have to touch the sides of the pan. If it is too large, then tuck under the edges a little, to accomodate the pan. If it is too small, don’t worry, just put it on top anyway. Using a sharp knife, score the dough into 10 servings. Poke each serving with a fork in the center. This makes it pretty and easy to serve. 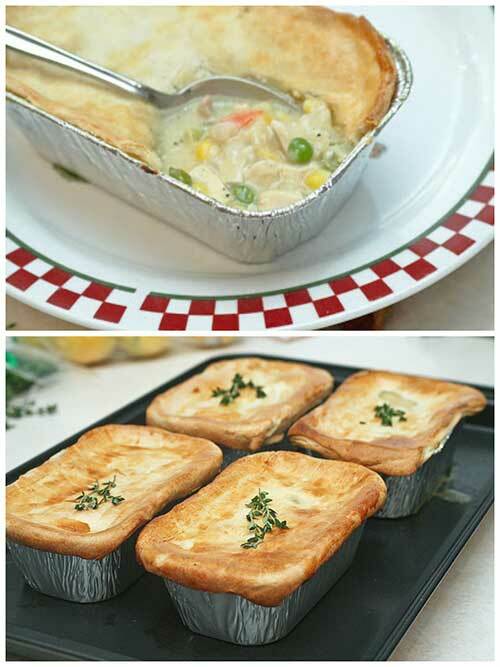 Thanks for checking out our best chicken pot pie recipe article. If you found it useful please consider sharing it on Facebook and pinning it to your relevant Pinterest boards, this will help spread the word and help hundreds of people gain more room in their plastic bag storage area. See you on the next one!